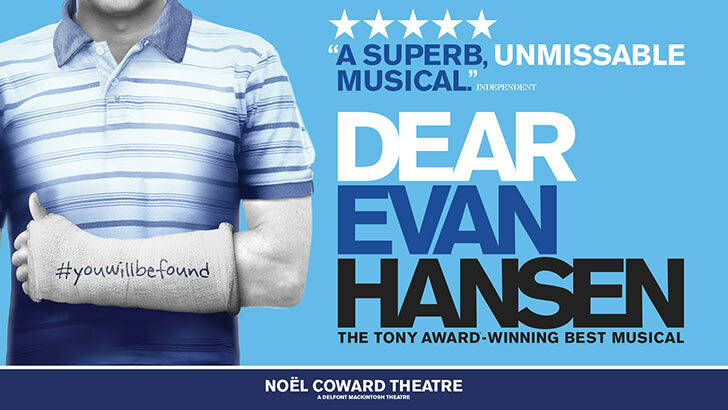 Producer Stacey Mindich today is pleased to announce the on sale dates for the West End production of the Tony award-winning musical DEAR EVAN HANSEN. For those who have registered for priority booking, tickets will go on sale at 12noon (GMT) on Thursday 28th February 2019. Public booking will follow at 10am (GMT) on Monday 8th April 2019. DEAR EVAN HANSEN will begin previews at the Noël Coward Theatre on Tuesday 29th October 2019 with opening night on Tuesday 19th November 2019 at 7pm. Casting will be announced at a later date. A letter that was never meant to be seen, a lie that was never meant to be told, a life he never dreamed he could have. Evan Hansen is about to get the one thing he's always wanted: a chance to finally fit in. Both deeply personal and profoundly contemporary, DEAR EVAN HANSEN is a new musical about life and the way we live it. Reuniting the original Broadway creative team for this West End production, DEAR EVAN HANSEN features scenic design by David Korins, projection design by Peter Nigrini, costume design by Emily Rebholz, lighting design by Japhy Weideman, sound design by Nevin Steinberg, and hair design by David Brian Brown. Music supervision, orchestrations and additional arrangements are by Alex Lacamoire. Ben Cohn is the Associate Music Supervisor. Vocal arrangements and additional arrangements are by Justin Paul. Danny Mefford is the choreographer. Casting by Jill Green Casting. Sash Bischoff, Adam Quinn and Danny Sharron are the Associate Directors. Judith Schoenfeld is the Production Supervisor. US General Management 101 Productions, Ltd. Adam Speers is Executive Producer. DEAR EVAN HANSEN has won the Drama League Award for Outstanding Musical Production and for the off-Broadway production, two Obie Awards, a Drama Desk Award, two Outer Critics Circle Awards and two Helen Hayes Awards. The Grammy Award-winning Original Broadway Cast Recording of DEAR EVAN HANSEN produced by Atlantic Records, was released in February 2017, making an extraordinary debut on the Billboard 200 and entering the chart at #8 - the highest charting debut position for an original cast album since 1961 - and went on to win the 2018 Grammy Award for Best Musical Theatre Album. A new deluxe version of the cast recording, including six bonus tracks and a pop cover from Katy Perry of Waving Through a Window is now available digitally. DEAR EVAN HANSEN opened on Broadway at the Music Box Theatre to great critical acclaim on 4th December 2016 where it has broken all box office records and recently celebrated its two-year anniversary. A record-breaking US national tour launched in October 2018 and in March this year a production will open at Toronto's Royal Alexandra Theatre.